Ever since the EMC upgrade I have not be able to use the site. I was locked out of most items and I still cannot see SR's. I am totally not enjoying this new site. Currently this site is unusable for me. Currently receiving the following error: "MyService360 is currently unavailable. We apologize for any inconvenience." Thanks for your post. The 500 character limit on the SR notes was a bug that was fixed last week, so the maximum character limit for a SR note is 32K characters now. My apologies for the inconvenience that caused you. If you are still experiencing that issue, can you please reply to this post? Thanks for your post. Yes, there was an outage with the MyService360 experience on Tuesday and Wednesday this week, and came back online on Wednesday at approximately 6:30pm EST. Our team has been working diligently to fix intermittent technical issues and implement enhancements to Online Support and MyService360 based on customer feedback. We are committed to delivering you a world-class customer service experience and apologize for how this outage impacted your service experience. Based on your post, it seems like you may have been having other issues accessing Online Support functions. I will reach out to you directly to confirm what issues you are still having. Thank you for your continued patience as we work to evolve and improve your Online Support and MyService360 experience. Thanks for the response. Been having a hard time with EMC/DELL support lately so excuse my frustration. Sorry I made it sound like I need a tour of the new MyService360 site. Think I have that covered. I'm having some site access issues to one of my sites apparently, they are struggling to get is resolved for me, if I can get them to stop telling me the same thing. It looks like a lot of my issues have been cleared up. Suddenly one day I was able to function in MyService360 to where I can see things and I do not see any little locks anymore. I'm in favor of change, and endorse change, however this transition to MyService360 has been trying. For me it has been a little confusing and not very intuitive. I have been working with customer support via email and they have been great in assisting me. I do have a question....in the previous web gui I remember there was a selection to look at "dial home" SR's to see which equipment dialed home. I cannot seem to find this option. Has it been eliminated? Brant thank you for replying to me. You're welcome. I'm glad we were able to get your issues resolved and I appreciate your continued feedback. Regarding your additional question, there is a column on the far right of the Open SRs view list grid called "Channel", which you can click-drag to move it to a different location on the grid if you desire. Any of your dial-home SRs will display "Dial Home" in that channel column as shown in the screen shot below. You can also click that column header to sort your view by channel. Thank you for your reply; however, I’m not sure you understood my question…I guess first I I’m interested in how the new web site MyService360 works and how can I request help or get one –off answers? I want to merge this data into our internal reports and cut-n-paste doesn’t meet the need. Your thoughts on how I my do this would be greatly appreciated. Thanks for your inquiry. Sorry for the confusion, but my previous post from yesterday was actually a response to a different customer’s post. If you want to ask us more questions about the site, I, or another one of my peers, can arrange time to speak/webex with you offline to answer questions you may have. Let me know if you want us to set up some time with you. 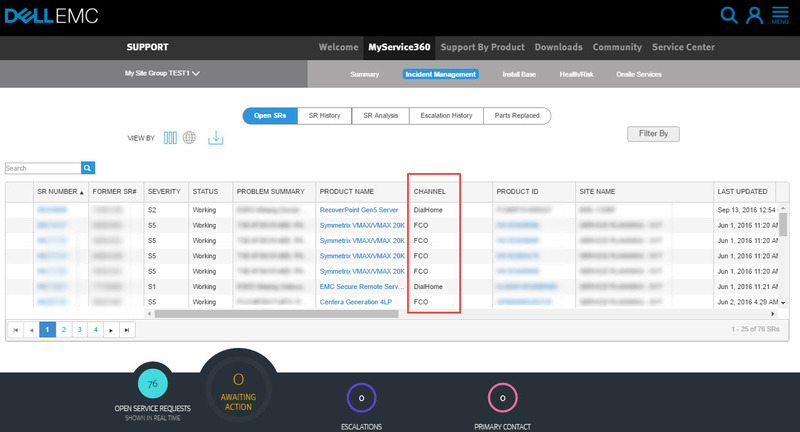 The Myservice360>Install Base>Code Levels unfortunately does not currently have the capability to export the data from the table into a .csv worksheet; however that is an enhancement we do already have on our roadmap. At this point I do not have a precise delivery date for this functionality but it will be coming soon, hopefully by early 2017.
more than a week ago I requested access to Service Center and Online Support but the access is still locked. I see locks on the different tools on the Service Center page and I don't have access to MyService360 features. I already opened two service requests writing emails to support@emc.com. Friday 28/10/2016 I called EMC support team by phone and they raised the priority of the SR but I still don't have access to service. Could you help us to gain service center access?